Take a step back in time to learn about the life and times of women at Camp Floyd. The Ladies of Camp Floyd Day Camp is designed to teach participants ages 8 - 11 some of the everyday activities faced by the women who called Camp Floyd home. Established in 1858, Camp Floyd housed the largest concentration of U.S. troops then in the United State. The troops were sent to Utah to suppress a rumored Mormon rebellion which never took place. The army was recalled back east in 1861 for the Civil War emergency. 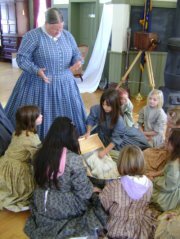 Participants will wear a period dress, meet costumed interpreters, play 19th Century games, learn etiquette of the period, learn period dances, make and take home a lace collar, wool yarn bracelet, personalized photograph and more. The camp is designed to complete the requirements for the Junior Girl Scouts Playing the Part badge. This program is also appropriate for an LDS girls Activity Day event. The camps are limited to 24 participants and run from 10am to 4pm. Reservations and a $20 camp fee are required. The first Ladies of Camp Floyd Day Camp is scheduled for November 10, 2012, and is open to anyone 8 - 11 years of age. Parents or guardians are encouraged to attend as well. Registration for this camp can be made on line at: http://stateparks.utah.gov/node/2952 This year, Camp Floyd is excited to partner with the Girl Scouts of America for the Ladies of Camp Floyd Day Camps. The dates of these camps are December 8, 2012, January 19, 2013, and February 9, 2013. These are limited to Girl Scouts and registration can be made through their website at: http://www.gsutah.org The registration for either camp is the same price and the leaders/parent will participate fully in all activities.